Parents are complimentary about the opportunity their children have to be outdoors. 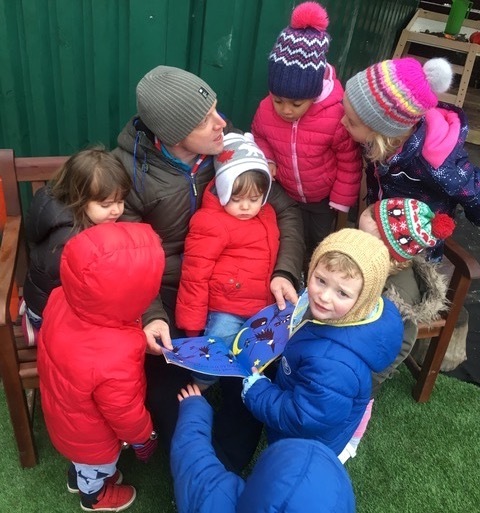 Staff encourage children to understand the importance of outdoor play. Children access a broad range of activities in the garden and enjoy the fresh air and exercise. This helps to promote their good health and support their physical well-being. The manager uses her knowledge of the early years foundation stage to improve the quality of the provision. She runs workshops for parents to support extended learning opportunities at home. Staff interact with children effectively and know what interests them. They extend opportunities to develop children’s communication and language skills, i.e. talking about different types of dinosaurs. Young children impulsively choose their favourite books and sit with staff for stories. This supports them well to make good progress in their learning and development. The manager continuously strives for excellence and responds enthusiastically to parents’ and children’s feedback. Following the parents’ meetings, she develops additional opportunities for communication through a sophisticated online app. The key-person system is effective and supports babies forming secure attachments. Staff engage parents extremely well, especially during initial assessments. They share how children are learning on a regular basis and invite parents to join off-site activities. Safeguarding is effective. Staff know how to respond if they have a concern about a child in their care. The manager has robust systems in place for the recruitment of staff. Staff observe and support each other to highlight good practice and encourage personal development. 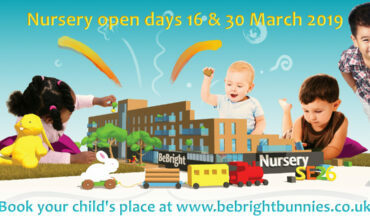 BeBright Bunnies nursery provides a mentor to support new staff consistently during the induction process. The manager effectively monitors and tracks children’s assessments. She identifies outcomes for groups of children and shares information during meetings, ensuring staff address any gaps in children’s learning promptly. The manager is highly reflective and evaluates the provision effectively. She takes positive steps to improve outcomes for children. The Nursery staff provide a stimulating environment. Children’s imaginative play is engaging in well- resourced play areas. Children build different forms of transport and homes with large bricks. They spontaneously take pretend baskets of food from the home corner to extend their play with the large construction bricks. Staff apply ‘creative thinking’ training to broaden the wide range of challenging activities they provide indoors and outdoors. Staff provide some activities for children to learn about people and communities beyond their immediate experience. For example, during a story, children explored the different costumes princesses may wear around the world. Children enjoy working together to create rhythms as they play instruments. Staff model and repeat language. They skilfully introduce new words and encourage children to recall events and activities that take place at home. Young children are encouraged to investigate different textures. For example, outside they eagerly explore trays that hold water, foam and mud. They explore these using their senses and watch the effect different textures have when they are poured on the ground. Staff are skilled at supporting children to be emotionally well prepared for the next stage in their learning. Babies and young children learn to respect each other during play. Parents comment that transitions are seamless because of the way children engage with their peers. Children behave extremely well and know how to keep themselves safe. They gain a good understanding of how to manage risks through activities that encourage them to explore. For instance, children are guided to manage knives as they individually cut and investigate different tropical fruit. 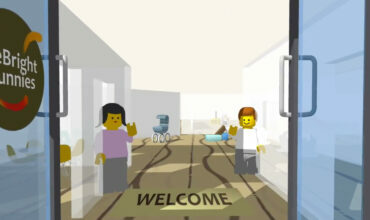 Staff encourage young children to manage their personal needs. Babies thoroughly enjoy wiping their own faces after meals. They develop their concentration. They skilfully learn to listen to staff and follow their instructions. Young children enjoy finding where things go as they pack away. Older children are curious and are interested in investigating natural resources when they compare concepts, such as ‘same’ and ‘different’. All children make good progress, including those for whom the setting receives funding. We’re focusing on the key points to turn our good Ofsted rating into an outstanding Ofsted rating, i.e. supporting children’s growing independence and self-help skills so they have opportunities to do things themselves. Our staff are being encouraged to consistently make the most of opportunities to develop children’s understanding of cultures, traditions and each other’s differences. We will be applying the same high standards at our new 120 space nursery in Lower Sydenham. checking records, procedures and other documents. Our nursery manager – Cher Walker-Moore – has every confidence that our south east London nurseries can achieve outstanding Ofsted results. In Spring 2019 we’re opening our second nursery in Lower Sydenham and we’re looking for outstanding candidates. if you have the skills to excel in childcare, please follow the link to secure a rewarding job, with great colleagues, in a fantastic location.